Mirror Lake is one of Yosemite's most popular tourist destinations, located in the northwest corner of Yosemite Valley at the mouth of Tenaya Canyon. During the spring runoff, Tenaya Creek floods and forms several beautiful lakes that are indeed quite reflective, especially in the morning light. 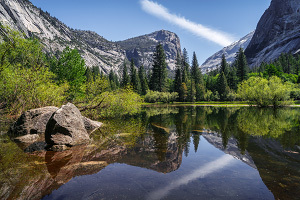 But since Mirror Lake is conveniently located in the heart of Yosemite Valley with several hiking trails and a paved biking road leading right to it, be prepared to share the sights with many other people. If you're looking for a longer option, a hike along this section of the Park Loop Trail offers great views from directly under the face of Half Dome. 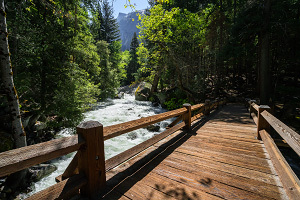 W There are many ways to get to Mirror Lake, including riding the Yosemite Valley Shuttle System to the Mirror Lake Trailhead (Shuttle Stop 17), biking one of the paved bicycle trails, or hiking the Valley Loop Trail to Mirror Lake. During the crazy crowded summer months, it is often more pleasant to walk a few miles in Yosemite Valley than to fight the crowds on the shuttle buses. Handicap vehicle parking and plenty of bike racks are available at the end of the spur road near Mirror Lake. It's a very short and easy stroll along the groomed trails to get to several lakeside spots where you can admire the views of the seasonal lake(s). Note that visiting is most pleasant in late spring during the peak of snowmelt; by late summer, the lakes turn to swamps or dry up and aren't the most photogenic. For an optional longer hike, consider hiking the stretch of the Valley Loop Trail behind Mirror Lake to escape some of the crowds and to see the beautiful landscape of rockfalls under Half Dome. 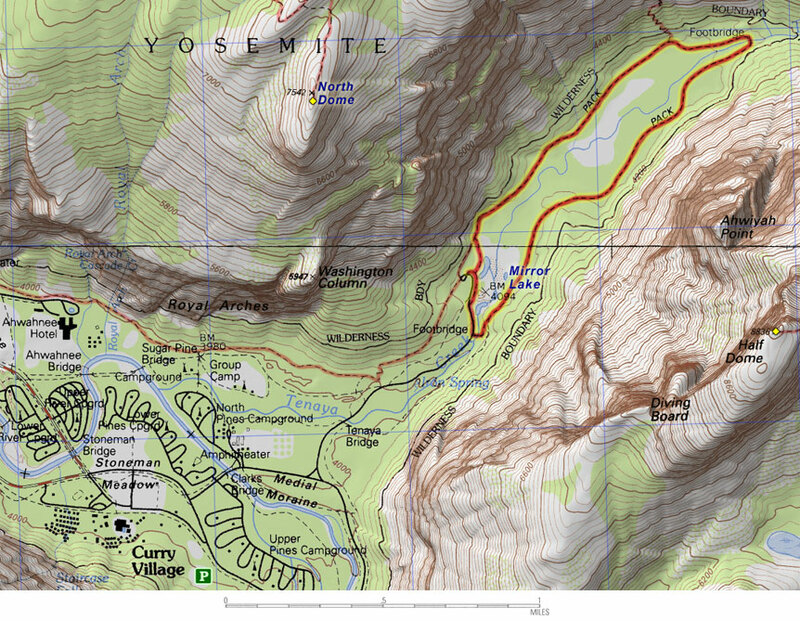 The junction with the Snow Creek Trail out of the valley can be found at the north end of the loop. Note that during heavy spring runoff years, parts of the trail near the base of Ahwiyah Point are often wet from overflowing Tenaya Creek. While Mirror Lake is pleasant and can be very beautiful if you catch it in the right light, this is a spot that everybody in Yosemite Valley flocks to so it feels like you're hanging out in a busy city park, complete with people sitting in the water with lawn chairs. If you're looking for a wilderness experience, this is not the place to go.